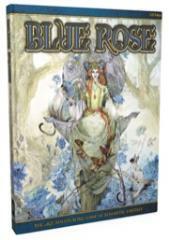 A decade ago Blue Rose shook up the RPG scene with its vision of romantic fantasy and inclusive gaming. Now the world of Aldea returns in a new edition using the Adventure Game Engine (AGE), the popular rule system that powers the Fantasy AGE and Dragon Age roleplaying games. This beautiful, full-color book contains everything needed to create and tell stories of heroic envoys of the Sovereign's Finest as they protect their homeland of Aldis from threats like the shadowy Kingdom of Kern and the fanatical Theocracy of Jarzon, as well as monsters and artifacts from the cruel reign of the Sorcerer Kings. Aided by the rhydan - their psychic animal allies - the champions of the Kingdom of the Blue Rose safeguard the light of the world against the power of Shadow. Will you answer the Sovereign's call?